Speck on coastal tomato. In summer (May through July) 2011, bacterial speck disease of tomato is commonly found in a number of fields in coastal tomato-growing areas in Santa Clara and Monterey counties. No doubt the periodic and prolonged rains earlier this year are a major factor in this unusual development. Symptoms consist of dark brown to almost black spots on leaves and sometimes stems. Leaf spots can be circular or angular in shape and individual spots are generally smaller than ¼ inch in diameter. 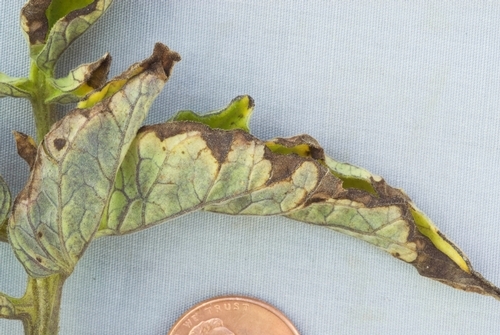 Spots are visible from both top and bottom sides of the infected leaf and are sometimes surrounded by a yellow halo. Leaf spots can merge together and result in the death of large areas of the leaf. On occasion the leaf spots may be located along the edges of the leaves and result in elongated lesions. Stems and petioles also can develop dark brown to black spots that are irregular in shape but tend to be slightly elongated along the axis of the stem. 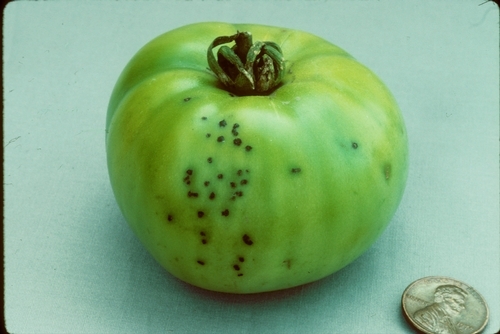 If the pathogen is splashed onto the fruit, disease symptoms on green fruit will consist of small (generally less than 1/8 inch in diameter), slightly raised, superficial black lesions or specks. Such specks usually are not surrounded by haloes. Confusion of symptoms. Symptoms of bacterial speck on tomato foliage can closely resemble symptoms from the other bacterial leaf spot disease of tomato, bacterial spot (caused by Xanthomonas campestris pv. vesicatoria). 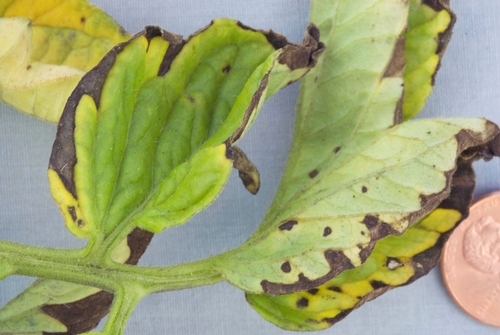 In addition, Tomato spotted wilt virus may infect tomato and also cause circular to irregularly shaped, dark brown spots on leaves, again resembling bacterial speck. For all three of these problems, precise confirmation of the pathogen will require laboratory testing. The speck pathogen. Bacterial speck is caused by the pathogenic bacterium Pseudomonas syringae pv. tomato. Strains of this pathogen are thought to be host specific to tomato, and two distinct races (races 0 and 1) have been documented. This pathogen is seedborne. Bacterial speck on the coastal tomato crop is usually quite minor in severity; once rains stop and if overhead sprinklers are not used, the disease is rarely seen in the summer. Disease development. Primary inoculum can come from infested seed, diseased plant debris in the soil, or infected volunteer tomato plants. Infested seed is a particularly important inoculum source; if infested seed is used to produce transplants, these plants are often grown under greenhouse conditions that encourage disease development and spread. The practice of using overhead sprinkler irrigation (in the greenhouse or in the field) can significantly spread the pathogen. Once diseased transplants are in the field, the pathogen can be spread plant-to-plant via splashing water (rain, sprinkler irrigation), contaminated tools and implements, and worker’s hands. Disease development is favored by high humidity (greater than 80% relativity humidity), free moisture, and relatively cool temperatures. Again, the rains that occurred through June 2011 certainly encouraged the development of this problem. Interestingly, for all the numerous tomato samples tested by the UCCE diagnostic lab in Salinas, all samples were positive for speck only; bacterial spot disease was not detected at all thus far in 2011. Control. Obtain and plant high quality seed that does not have detectable, economically important levels of P. syringae pv. tomato. Use a hot water seed treatment or treat seed with hydrochloric acid, calcium hypochlorite, or other recommended materials. Seed treatments must be applied carefully because hot water treatments can reduce seed viability and germination. Avoid using overhead sprinkler irrigation in the field. Applying preventative spray applications to transplants still in trays or to field planted crops may be appropriate. Before using any pesticides, check with your local Agricultural Commissioner's Office and consult product labels for current status of product registration, restrictions, and use information. Photo 1. Oval to rectangular leaf spots caused by bacterial speck disease of tomato. Photo 2. Angular spots on leaf margin caused by bacterial speck disease of tomato. Photo 3. 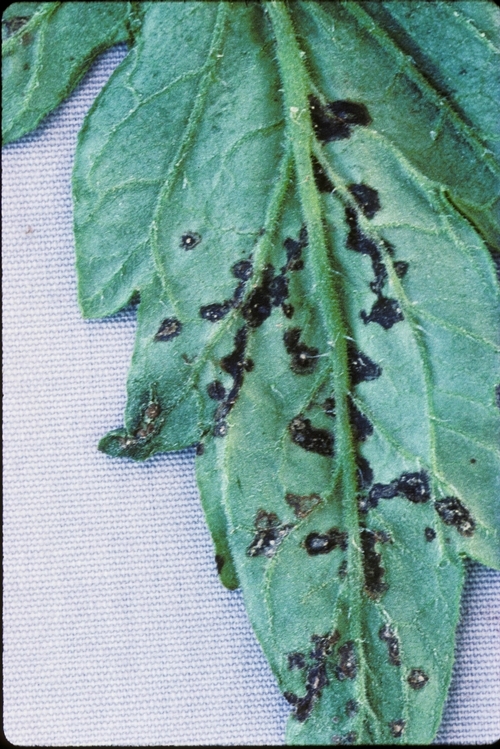 Angular spots on leaf margin caused by bacterial speck disease of tomato. Photo 4. 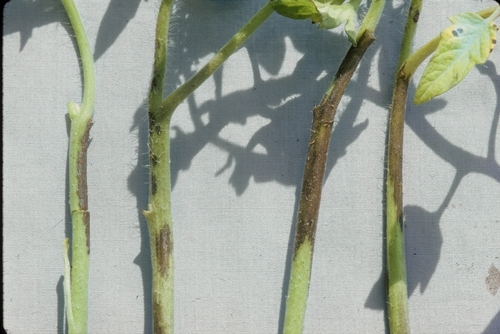 Elongated stem lesions on transplants caused by bacterial speck disease of tomato. Photo 5. Fruit speck symptom caused by bacterial speck disease of tomato.